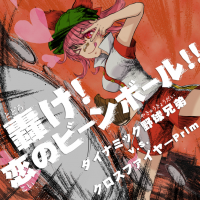 Prim "Kaku-chan, Prim wo koushien ni tsuretette!" L.E.D.-G "Takako to Yoshiko no tsugi deiikana?" atashi kokou no OUT LOW! atashi PINCH no SOUTHPAW dakara~! Everyone "heihei minna ga bibitteru"
Everyone "out! safe! out! safe! outoutsafesafe! aitsu wa madaka! isoge! RELIEF CAR!" A rock arrangement of 轟け！恋のビーンボール！！, titled 轟け！恋のビーンボール！！～96バット砲炸裂！GITADORAシリーズMVP弾！～, appears in GITADORA. 轟け！恋のビーンボール！！ is one of the songs part of the Second Half of the Nettou! BEMANI Stadium (熱闘！BEMANIスタジアム) event. In jubeat saucer fulfill, it can be unlocked as part of saucer macchiato's Side Menu from August 26th, 2014. In REFLEC BEAT groovin'!! and REFLEC BEAT groovin'!! Upper, 轟け！恋のビーンボール！！ can be purchased from the REFLEC Shop after clearing it in the BEMANI Stadium Test (BEMANIスタジアム検定) added on July 24th, 2014. In REFLEC BEAT VOLZZA and REFLEC BEAT VOLZZA 2, 轟け！恋のビーンボール！！ is playable by default. 轟け！恋のビーンボール！！ marks the first collaboration between Toshiyuki Kakuta and Jun Wakita in BEMANI that isn't a rearrangement of a classic song. It also marks the first time Jun Wakita composes a song featuring Mayumi Morinaga as the vocalist. 轟け！恋のビーンボール！！ is the first Prim song to feature male vocals. It is also the first Prim song without lyrics by mitsu. 轟け！恋のビーンボール！！'s lyrics include references to several baseball terms, anime series such as Kyojin no hoshi and Touch, and to some BEMANI artists as well (Toshiyuki Kakuta, Takayuki Ishikawa, and Yoshitaka Nishimura). 轟け！恋のビーンボール！！ marks the first original song sung by Prim in the DanceDanceRevolution, pop'n music, SOUND VOLTEX, and ミライダガッキ FutureTomTom series. In pop'n music, instead of displaying its character's portrait, 轟け！恋のビーンボール！！ displays its jacket (with the 熱闘！BEMANIスタジアム logo) when selected. When 轟け！恋のビーンボール！！ is played on beatmania IIDX, the arcade LED ticker displays "THUNDER LOVE BEANBALL !". In jukebeat, 轟け！恋のビーンボール！！'s title and artist were changed to THUNDER LOVE BEANBALL ! and DYNAMIC BASEBALL BROS. V.S. CROSSFIRE Prim, respectively. 轟け！恋のビーンボール！！'s genre is kept in Japanese in beatmania IIDX. From DanceDanceRevolution (2014) onwards, 轟け！恋のビーンボール！！ appears in the DanceDanceRevolution (2014) folder instead of the (2013) folder. 轟け！恋のビーンボール！！ is the CHALLENGE2 unlock of DanceEvolution ARCADE's CHALLENGE category (CHALLENGEカテゴリー) unlocking system. An alternate choreography for 轟け！恋のビーンボール！！, titled 轟け!恋のビーンボール!! (9回裏振付ver), also can be unlocked via CHALLENGE category. 轟け!恋のビーンボール!! (9回裏振付ver)'s subtitle refers to baseball's ninth inning, where a home team which scores to take a lead in any extra inning automatically wins, regardless of the number of outs. 轟け！恋のビーンボール！！ can be unlocked in BeatStream アニムトライヴ from September 14th, 2016 as part of the Suzuki-san present daisakusen (スズキサンプレゼント大作戦) event. After being removed from the initial release of REFLEC BEAT 悠久のリフレシア, 轟け！恋のビーンボール！！ was revived on January 18th, 2018. The ポップンミュージック キャラクターイラスト コンプリートDVD includes an unused portrait for LISA labeled as being made for 轟け！恋のビーンボール！！. However, given that no new portraits were made for 熱闘！BEMANIスタジアム songs, it might be from the location test version of 猛烈宇宙交響曲・第七楽章「無限の愛」, which did use the same LISA. 轟け！恋のビーンボール！！ is one of the qualifying round songs in the The 8th KONAMI Arcade Championship for beatmania IIDX 26 Rootage. 轟け！恋のビーンボール！！ is available in beatmania IIDX INFINITAS as part of the beatmania IIDX INFINITAS 楽曲パック vol.4.